Luxembourg-based company Ujet unveiled a smart scooter at CES 2018 in Las Vegas, the world’s largest electronics fair. Ujet’s most innovative feature, in addition to its fourteen-inches orbital wheels, is that it can be folded into three parts in a few seconds, so that its owner is able to carry it in the elevator or in the car trunk without too much effort, since its weight is less than fifty kilos. The battery can also be removed and transported as if it were a luggage trolley. With an alloy frame made of carbon fiber and magnesium, Ujet owns an engine of four kW power output and a torque output of ninety Nm in the rear wheel, regenerative braking and a delivered top speed of fourty five kms per hour, as a normal motor cycle. Charging times may vary between three and six hours with the on-board charger, and between one and two hours with the fast charger. The Ujet also gets the best of communication technology, with connectivity options for 3G, GPS, WiFi and Bluetooth. 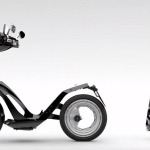 Apart from the fact that the scooter can be unlocked and started via your smartphone, it also gets a fully digital instrument panel that allows you to connect your phone to configure the scooter. You can even get social media updates, access the web and view the world via an onboard HD camera. The scooter also gets built-in speakers and a slot to power mobile devices via its ‘power bank’ mode. At the time of the order, you can customize it by choosing between two different body designs, two different seat heights and five different colors. Prices start from 8,690 euros.